Yup, that's my focus this year, setting goals and achieving them. "Duh!" You say? "How did you figure that out Sherlock?" You ask? Well, I know it's a bit from the Captain obvious book, but somehow I managed to forget about that goal thing while I was putting all my efforts on the process. It's a weird thing to maintain a lifestyle for a long period of time. You have phases where you do very well, you have phases where you just don't have to think about it "This is how I live now" and there are phases where you just do it all wrong, and just can't seem to get it right. I feel like I've gone from one to another in rapid succession all through 2011. How tiring! I know what I have to do: Plan ahead so that I can be prepared to cook my meals (instead of eating junk, or ordering out), work out regularly, keep track of what I'm doing, limit the treats... I know all about it, I know how to do it, I enjoy doing it even, so why is it so complicated? I know how, but do I know why anymore? Losing weight for me was easy. Hate me if you will, I can live with that, but I'm an all or nothing kind of person, and on short term, I can deal with pretty much anything. I was very VERY strict about my eating while I was losing weight, I also was working out minimum 1 hour per day every day, including high intensity cardio for at lest 30 minutes each day. Of course I was also in my late 20s, which made it easier for my body to take the torture I was putting it through at the gym every day. Now I'm a little older, soon to be 38, and I find it difficult to hit the gym with that kind of an intensity. This summer, I decided that my goal was to be able to do 1 pull up. At first I said by September 1st, then by December 31st, well it's the 26th, and it's not happening. I think the problem lies in the fact that I really don't care about a pull up anymore. I don't see that as being worth the effort. I like lifting weights, but more because of how it changes my body rather than because of the actual number of pounds I can lift. I guess to me that is never going to be impressive no matter what. So there, the numbers game isn't cutting it anymore, so what? What is it that would REALLY make it worth it to me to rebuild my dying routine? What could I work for, that would make it worth it to get up early in the morning to do cardio? What could make it worth getting back to the gym to lift weights? Carry the gear, wash all the work out clothes? I need to lose 5 lbs, I want to lose 10. I need to build up my cardio in a big way (so lame). One day I would like to do that pull up, but I got to lose the weight first. I want my flat belly back!! 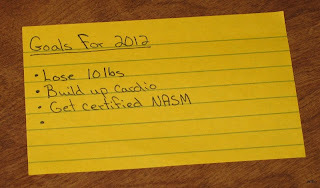 If I really focus on losing that 10 lbs, and building my cardio, the rest should fall into place right? Of course I can't stop lifting, I will lose what I worked so hard to build, but maybe it can be "part of my routine" as opposed to being the sole focus of my routine. At least for the first part of the year. The thing with cardio is that the more I do it, the easier and more enjoyable it becomes. Ideally I'd be doing cardio every day. Maybe I can start with a more reasonable schedule and build from that? Tuesday morning is laundry morning. So no working out early there. Thursday is usually my sleep in day (until 7!) because I work Tuesday and Wednesday evenings. Hum... I could hit the gym early on Monday, Wednesday and Friday, which just so happen are my husband's work out morning too. I bet if I ask nicely, he'd be more than happy to drop me off at the gym, or even better, make coffee and breakfast while I work out? How motivating to know that if I'm out early enough, I'll have breakfast waiting for me when I come back? Speaking of which, if I want to lose 10 lbs, I'll have to start planning ahead better. We're already well on our way there though. We've had long talks about starting to cook ahead like we used to do. Make dinner with tomorrow's lunch in mind. We've been pretty good with that as a general rule, but just got a little lazy this fall with all the celebrating going on. Grains and vegetables are back on the menu and that's a good thing because we both love them! In 2012, I will lose 10 lbs (and then maintain the loss) and I will build up my cardio to the point of being able to make my elliptical work out 60 minutes at my normal speed. What about you? 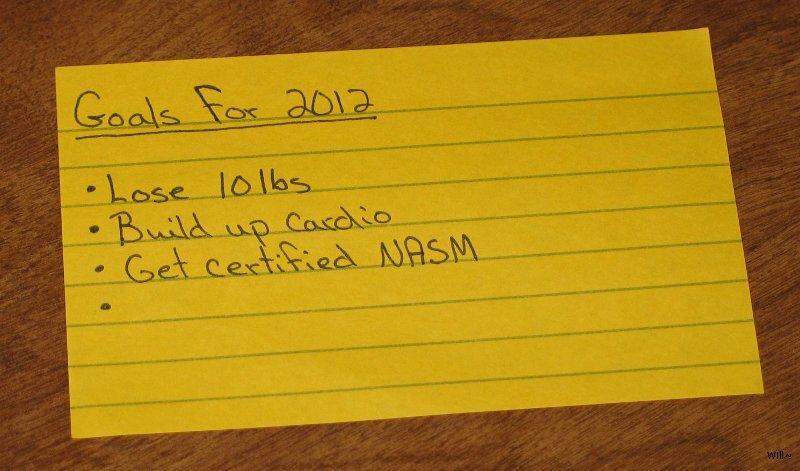 What goal is worthy of your efforts in 2012?